This was the last day for National Poetry Writing Month. I wrote the equivalent of one poem a day, but as so often in my life I found I had to adjust my expectations. I wrote more some days, and not at all on others. Learning to be more moderate and realistic, letting go. I don’t like that I cannot go all out every day, but I do like being able to relax a bit and sit without having to be “productive” every moment. I hope you will visit some of the sites of other poets who took part this year. There is a list at NaPoWriMo.net. Enjoy! For once, all instruments are coming in on time. of the tom-tom, the bongo, the bass and the snare. are coming in on time. The tadpoles are getting bigger, and respond now when a shadow passes overhead. Naturally more aware, or have they now experienced loss? Do they know fear? Do they know joy, as they rest on the slowly skeletonizing chestnut leaves? Do they anticipate the changes, understand the twitching, itching — there, just under the skin — do they know that legs and toes are on the way? Do they need to know? and making it through to the bell. —By way of explanation, I twisted my ankle and went down in front of my students on Monday (not a true workplace injury, but an artifact of bad body mechanics). So this post comes late… Pride was hurt, and the ankle isn’t happy, but life goes on. And learning never ends. Perhaps the lesson my students needed wasn’t the best way to calculate sums, but the best way to get hurt and not pitch a fit. Asking for help from the students (carry this, ask the nurse for an ice pack) and from my colleagues (walking my students to the bus with theirs at the end of the day…) was a life lesson the kids can take with them, I think. I kept doing my job while letting other help me. Crutches, a bandage, and I am back in the game today! their places by the tadpoles. welcomed the promise of wonderful things. Donations to organizations that help in times of disasters are needed, now and every day. The International Red Cross is one that can help. You can Donate through the American Red Cross. 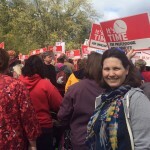 This is what I did Saturday morning, rallying for full funding for schools: smaller class sizes, basic cost of living increases to keep pace with inflation, more support overall for the teachers who care for our children. Set an example for your children and students. Take part in your democracy. Peaceably assemble and petition your government to make it better. Our children are our hearts, our future. They depend on us to stand up for them. 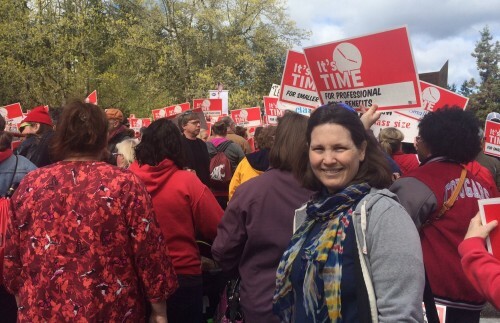 It’s not much, and no one seems to care to really cover this issue, but the AP did release a short story that was picked up by local outlets: Teachers Rally in Olympia. Thanks to Derrick Nunnally for writing about this attempt to help people understand that our nation’s children are important to all of us! and the moment is lost. longing for a less lonely life.